Kalpak Shah is the founder and CEO of Clogeny, a company that does consulting & services in cloud computing. His talk is about the various choices available in cloud computing today, and how to go about picking the one that’s right for you. View more presentations from Clogeny Technologies. These are the slides that were used by Kalpak for this talk. Click here if you can’t see the slideshow above. Support and Helpdesk. Is it 24×7? Email? Phone? Hardware and Performance. Not all of them are the same. Amazon EC2 not as good as Terremark. OS support. Which OS and distributions are supported. Is imaging of server allowed? Is distribution and re-selling of images allowed? Not everybody allows you to save the current state of the server, and restart it later on a different instance. APIs and Ecosystem. What APIs are available and in what languages. Some providers don’t do a good job of providing backward compatibility. Other might not be available in language of your choice. EC2 and Rackspace are the best in this area. Licensing is a big pain. Open source software is not a problem, but if you want to put licensed applications on the cloud, that is a problem. e.g. IBM Websphere clustering is not available on EC2. Or Windows licenses cannot be migrated from local data center to the cloud. Other services – How much database storage are you allocated? What backup software/services are available? What monitoring tools? Auto-scaling, load-balancing, messaging. Kalpak has put up a nice comparison of Amazon AWS, Rackspace, GoGrid and Terremark on the above parameters. You can look at it when the PPT is put up on the IndicThreads conference website in a few days. This gives you a full platform, not just the hardware. You get the development environment, and a server to upload the applications to. Scalability, availability managed by the vendor. But much less flexibility than infrastracture-as-a-service. You are stuck with the programming language that the PaaS supports, and the tools. For example, Google AppEngine. Which is available only for Python and Java. Or Heroku for Ruby + Rails. PaaS is targeted towards developers. This gives you a consumer facing software that sits in the cloud. You can start using the software directly, or you can extend it a bit. A business layer is provided, so you can customize the processes to suit your business. Good if what is provided fits what you already want. Not good if your needs are rather different from what they have envisoned. Instead of storing data on your local disks, store it in the cloud. Lots of consumer adopton, and now enterprise usage is also growing. No management overhead, backups, or disaster recovery to worry about. And pay either flat fees per month, or by the gigabyte. Examples: Mozy from EMC. Amazon S3. Rackspace CloudFiles. Carbonite. DropBox. Some choices automatically made for you based on development language and available skill sets. Python + Java? Use Google AppEngine. Ruby on Rails? Use Heroku. Microsoft shop? Use Azure. Other ways to compare are the standard ones: size of vendor and ecosystem maturity. Tools, monitoring, connectors, etc. e.g. AppEngine has a Eclipse plugin, so if your developers are used to Eclipse (and they should be!) then this is very good. Another question to ask is this – will the vendor allow integration with your private cloud? Can you sync your online hosted database with your local database? If yes, that’s great. If not that can be very painful and complicated for you. Eucalyptus: open source IaaS cloud computing platform. VMWare Cloud: Partnered with Terremark. Expensive but worth it. Appistry: Allows installing of the platform on Amazon EC2, or in your private data center. Allows application deployment and mgmt, various services across the stack IaaS, PaaS, SaaS. Integration with SQL Azure, SharePoint, Dynamics CRM. Visual Studio development and testing. Supports multiple development languages. You can either do regular relational databases (easy to use, everybody knows them, scaling and performance needs to be managed by you). Or do NoSQL – non-relational databases like SimpleDB (Amazon), Hadoop (Yahoo), BigTable (Google). They’re supported and managed by cloud vendor in some cases. Inherent flexibility and scale. But querying is more difficult and less flexible. Licensing is a pain, and can make the cloud unattractive if you’re not careful. So figure this one out before you start. SLAs are around 99.9% for most vendors, but lots of fine print. Still evolving and might not meet your standards, especially if you’re an enterprise. Also, if SLA is not being met, vendor will not tell you. You have to complain and only then they might fix it. Overall, this is a grey area. Pricing is a problem – it keeps changing (e.g. in case of Amazon). So you can have problems estimating it. Or the pricing is at a level that you might not understand. e.g. pricing of 10 cents per million I/O requests. Do you know how many I/Os your app makes? Maybe not. Compliance might be a problem – your government might not allow your app to be in a different country. Or, for banking industry, there might be security certification required (for the vendor) before the cloud can be reached. Consider all of these before deciding whether to go to a cloud or not. IaaS gives you the infrastructure in the cloud. PaaS adds the application framework. SaaS adds a business layer on the top. Each of these are available as public clouds (that would be somewhere out there on the world wide web), or private clouds that are installed in your data-center. Private is more expensive, more difficult to deploy, but your data is in your premises, you have better (local) connectivity, and have more flexibility. You could also have a hybrid cloud, where some stuff is in-house and some stuff in the public cloud. And if your cloud infrastructure is good enough, you can easily move computation or data back and forth. Kalpak Shah, CEO of Clogeny, gave a broad overview of the various options available in cloud computing infrastructure, platforms and software, and the questions you need to ask before you choose the one for you. 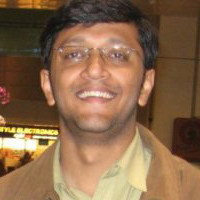 Kalpak Shah is Founder & CEO of Clogeny Technologies Pvt. Ltd. and guides the overall strategic direction of the company. Clogeny is focused on providing services and consultancy in the cloud computing and storage domains. He is passionate about the ground-breaking economics and technology afforded by the cloud computing platforms. He has been working on various cloud platforms including IaaS, PaaS and SaaS vendors. You can also follow @clogeny and @kalpakshah on twitter. It will be nice of you if you can provide Kalpak Shah’s E-Mail ID. Pingback: Which "aaS" is right for you?